This makes a nice backdrop for character pics, btw. Terrokar, near Auch, above where you summon the skeletal dragon to fight for the quest (big kudos to the designer on this one btw). Funny side note – if you have Witchhunter or similar running, you’ll see the lightning effects are called bunnies. Looking up when you’re dead, so the ghost world I guess if you want a specific ‘place’. This is not the ghost world, which has a black hole in the middle; nor is this in Netherstorm. Look up anywhere in the Bone Wastes, Terokkar Forest, and you’ll see this. same skin as when you die and look up, but in death its black. 1st reply is right, I agree with looking up in bone wastes. 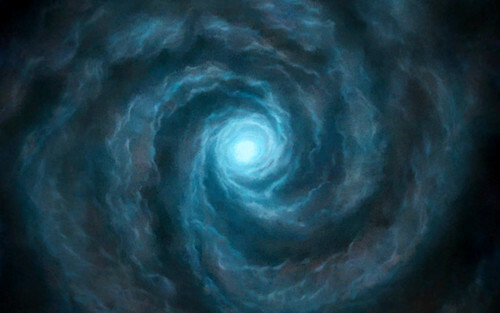 Awww, Foton, you beat me to the swirly whirlpool scresnshot! I don’t think it’s the same as mine but if it is then it’s not Bone Wastes. Thats a great shot – is there a huge version, as I’d like to have that as a desktop background. Nicely mounted on black would be sensational (and not automatically give away that I’m a geek). Click on it a few times and it will take you to the flikr account here, which has it in many sizes. One is bound to suit your needs. Yup, this is Terokkar Forest with the Wizard of Oz sky.